So I think I mentioned around Christmas how in love I am with Papertrey Ink. If I didn't, I should have. Their May release included a set of dies for making key fobs and I absolutely had to get them all. PERFECT gifts. In a big way! I've made a few but I'll post the rest when I finish this batch. However, this one I did for the the Papertrey Ink blog hop going on today. Wow! Love your keyfob! Great colors - great stitching! Now you are making me think I need this die! Great job! 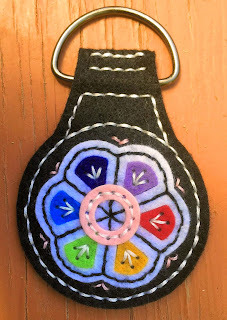 Someone is going to love their rainbow key fob, and you for making it! Beautiful and lovely hand sewing! Oh, I love how you were inspired by the photo to make a key fob! Fabulous! Oh that is lovely! Who wouldn't love that as a gift, it's so fabulous!